Waitrose & Partners first appeared on the high street in 1904 when Wallace Wyndham Waite, Arthur Rose and David Taylor opened their shop in Acton. They managed to create a successful business selling a wide range of grocery products. 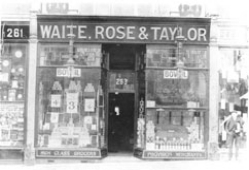 High standards and keen pricing ensured that the business grew, with Waite concentrating on the buying, Rose working behind the scenes on the accounts and Taylor working on the shop floor as the branch manager. After two years, Taylor left the business leaving Waite and Rose who formed Waitrose Ltd in 1908. The business continued to develop after Rose left in 1924 and the chain grew to include branches from Windsor to Gerrards Cross. Waite continued to supply these more affluent areas but also traded in less profitable locations, developing a group of shops he called Wyndhams. By 1937 Waite was looking for someone to take over the business and maintain the high standards he had instilled over the years. After a chance meeting with Michael Watkins, the Director of Trading for the John Lewis Partnership, the 10 shops and 160 staff joined the Partnership on 1st October. Waite remained in the business until he retired in 1940. The next major change in the fortunes of Waitrose & Partners was the result of the move to self service shopping in the early 1950s. The first shops to become self service were Schofield & Martin, a small chain of grocery shops based around Southend. By 1955 Waitrose & Partners opened its first supermarket in Streatham with 2,500 square feet of selling space. By the early 1970s there were 50 branches, some still small self service shops but more and more larger supermarkets. This led to the construction of a new distribution centre at Bracknell enabling the business to grow at a much faster rate. By 2004 the division had expanded to more than 200 shops including the acquisition of branches from other chains such as Morrisons and Somerfield. By this time the Leckford farm estate in Hampshire, which the Partnership owned, had become part of Waitrose & Partners. There followed a period of change involving the development of internet shopping, branches abroad and smaller format shops. The business continues to grow today but still aspires to Wallace Wyndham Waite's original intention to 'lift the food trade to a higher plane'. Find out what makes Waitrose & Partners different here. Visit our new Waitrose Memory Store site, where you can enjoy a striking account of images, annecdotes and facts about Waitrose & Partners. See for yourself how from one single shop in Acton, West London, Waitrose has developed over the years to define our company as you know it today.